Still can’t get your hands on a Pi Zero? We know. Why not de-solder a few headers from a Raspberry Pi 2 to fit in your next project instead? Using a pair of 2.5″ HDD enclosures, [nodenet] made a mini linux laptop using the Raspberry Pi 2 — It even has a touch screen, and features a 1000mAh battery! All in all it cost him about $120 for all the components, but before you rush out to make your own, you will need pretty good skills with a soldering iron to successfully downsize your Raspberry Pi 2. The modifications require removing both USB ports, the Ethernet plug, the GPIO pins, the HDMI port, the A/V jack and the camera connectors. 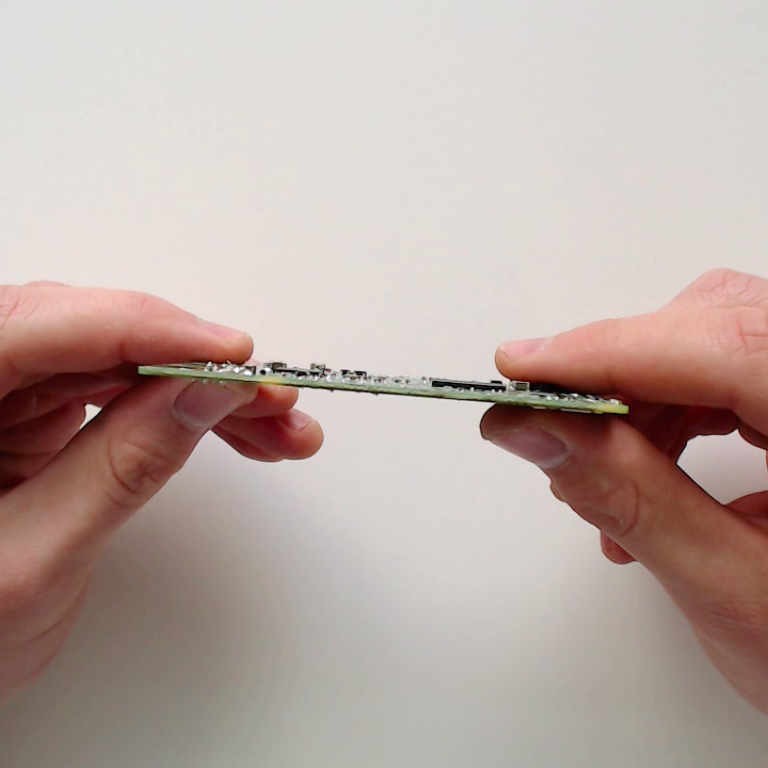 He used a combination of a mini hacksaw, and a soldering iron to remove all the components — what you’re left with his a business card sized computer — but the real fun part is re-attaching all the components with leads. The build reminds us a bit of this Nintendo DS housed Raspberry Pi clone — another contender for the smallest portable pi. Thats a pretty sweet use for a RbPI, i wouldve put a little more effort into the case (looks like it can be even thinner) & hinge (exposed wires? no ty) though, but who am i to complain, ive not built anything like it, so yea, nice job. Can’t get your hands on a 5$ board? Let’s just mangle a 40$ one and make a cellphone grade laptop!!! Come on. Typically Hackaday comment. Can’t you see how it is fun to build something? Do you really think that he uses it more often than 2 times? He made it, puts it on the bench and right now it maybe serves as a battery backedup webserver or toy for when his frends children are coming over. No one is required to duplicate items presented here DIY beyond one’s survival abstinence needs is a leisure time activity. The money spent here is nothing different than spending the same amount attending at an entertainment venue. ahahahaha! Classic! The guy who completely misses the point! It’s so much more than that – it’s a full Linux OS, unencumbered, in a form factor that you can’t buy a modern phone in today – the closest I think is probably the Nokia E90, which is very long in the tooth now. You can get close with a snap on third party keyboard and an ipad mini, but it’s still not pocketable. If you want a keyboard that is integral to the device, you are stuck – even netbooks seem to be dying as a format. I’m building something similar, to allow for remote system admin on the move – to replace a Lenovo Miix 3, which is nice device, but just too big to carry around all the time. I miss my Toshiba Libretto dearly. It never occurred to me that I could just make my own. Yes, the Libretto docking station was nice too. The Olivetti Quaderno was the pinnacle of the sub-netbook formats for me. Phenomenal battery life, with some clever design tweaks like a memo recorder. Currently I have a Pi + 5″ LCD & LiPO wireless charging squeezed into a small ABS box as a prototype, but it’s a bit heavier and much thicker than I would like. Time for some de-soldering on a Pi 3 board! What screen did you use in your prototype? HDMI or LVDS/parallel/whatever? I was thinking about making my own as well since I need a truly usable tablet but getting completely rid of Android from cheap tablets still seems pretty much impossible due to lack of drivers for open Linux kernels. As a board I was considering the Orange PI which likely has the lowest cost per MIPS. I have one OPi PC as a rtl_tcp SDR platform and it totally rocks. It’s only $15 but sadly no way to get that price elsewhere than Aliexpress. I miss mine too; like my N900s, I should have held onto them. Interestingly, the RPi 3 is more powerful than the two Librettos I had back in the early 2000s. This is begging for a more complicated swiveling hinge. Open the clamshel, spin the display 180 degrees and re-close. Now you have a tablet. See the clamshell Sharp Zaurus for an example. I miss my Zauri. Had the 3100, 3200 and the 6000. The video should have linked to the ‘How I made it’ video instead of the ‘What I made’ video. Soooo, wouldnt it be better just buying a (used) smartphone put linux on there and use otg and bluetooth for all peripherals? with enough hot glue you can fit it in a case too. but you got a hell lot more power, better screen, better touch, better battery, better everything over the raspi. Good luck installing a real Linux on any smartphone. Nope, Android is not Linux, not even close to its power and openness. I’d rather use a raspi or any other alternative with lesser battery life and screen but a real operating system than Android for anything serious. If you’re going to do that, first of all why are you on Hackaday, and second just buy a Nokia N900 on eBay, it already runs real Linux with full driver support. Nice, but it actually reminded me of the https://en.wikipedia.org/wiki/Nokia_N900 which you can still pick up for as little as $100 second hand. The N900 ran the Maemo 5 variant of Linux. In the video he says he was thinking of making a kit, yeah great idea, worth putting up on kickstarter to see if there is enough interest. I have an hp 100lx (or 95lx, I forget; haven’t seen it in years but I know I still have it). tempted to gut it out and stealth install something behind its keyboard, just for grins. of course I would not ruin it, but it would be an interesting build and experience to fit something useful in there. I have some old hp25 calcs that are dead and thinking of putting some cpu with some app behind there, too. why is there no commercial version of this? I just bought a tablet PC with win10 and 64 gigs of storage for $400 its small, but huge in comparison to this. if I could replace my android phone with something like this with cell pone capability I’d be all over it. you mean like the $160 Chuwi Hi10 with 4GB ram? was the other $200 brand tax? or did you mean you bought two units? Nice little build! I’d love to see this setup inside an Atari Portfolio case.